The human experience of the Vietnam War is almost impossible to grasp - the camaraderie, the fear, the smell, the pain. Men were transformed into soldiers, and then into warriors. Focusing in on just one company's experience of war and its eventual homecoming, Andrew Wiest shines a light on the shared experience of combat and both the darkness and resiliency of war's aftermath. Dr Andrew Wiest is University Distinguished Professor of History and the founding director of the Dale Center for the Study of War & History at the University of Southern Mississippi. Specializing in the study of World War I and Vietnam, he has served as a Visiting Senior Lecturer at the Royal Military Academy, Sandhurst and as a Visiting Professor in the Department of Warfighting Strategy in the United States Air Force Air War College. 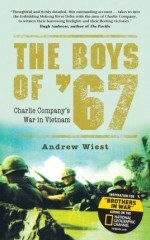 Since 1992 Dr Wiest has been active in international education, developing the award-winning Vietnam Study Abroad Program.Wiest's titles include Vietnam's Forgotten Army: Heroism and Betrayal in the ARVN (New York University), which won the Society for Military History's Distinguished Book Award, Rolling Thunder in a Gentle Land (Osprey), and The Boys of '67 (Osprey), which was the basis for the Emmy nominated National Geographic Channel Documentary Brothers in War. He lives in Hattiesburg, Mississippi with his wife Jill and their three children Abigail, Luke, and Wyatt.